COSAMP now offers a unique Professional Development (PD) solution for all music teachers who teach in a COSAMP member school, giving member teachers access to a comprehensive and flexible range of PD options. These include personal one-on-one training, group workshops, master classes and live remote-access video training, as well as free access to our webinar archives. If it suits you better, we can come to you and deliver tailored Professional Development workshops for any or all of the music teachers at your school. You tell us what you would like to cover and we’ll tailor a workshop that relates directly to your school’s music technology and curricular objectives. We can also provide each teacher with a PD certificate listing the workshop content as it relates to the Australian Professional Standards for Teachers. No matter where in Australia you are… from the city to the bush, as long as you have good internet access we are there to help our members! Using GoToMeeting, a COSAMP trainer can share screens with you, or even take control of your screen remotely to demonstrate skills and concepts. We’re at your service and ready to help in any way you need it! Choose your own focus area or have a wider ranging Q & A session. Remote access sessions can also be used to work through any technical issues you may be having, or we can teach you to troubleshoot any of your school’s music technology equipment. These face to face sessions are delivered by COSAMP trainers either at the Melbourne studios or at special PD events across Australia. Our Brighton computer music training suite features individual iMac workstations for all attendees, and our busy commercial recording studio facility gives teachers an exciting and stimulating real industry environment for true professional development. Our Master Classes are group workshops that feature renowned music industry professionals, including sound engineers, music producers, songwriters and performers. This style of PD workshop provides an insight for teachers into many of the skills and techniques used by the pros. Virtual Classroom is a premium content area of the Student site that allows students to access video content on a range of topics across the scope of music production, presented by industry professionals and experienced COSAMP trainers. Titles in the Virtual Classroom library include Using FX in a Mix, Writing Great Songs, How Sound Works, Pro Tools Basics and more! The videos are structured as interactive lessons, each with their own editable PDF worksheet, so school students right across Australia can tune in to watch lesson, right in the comfort of their own classroom or as homework to be critically discussed in class! Yearly access can be purchased by Member schools at an additional cost. Click here to go straight to the Student Site! The College of Sound and Music Production is pleased to offer Studio Workshops at our commercial recording studio, Salt Studios, in East Brighton, Melbourne. With two commercial recording studio spaces, plus a fully fitted MacLab training room, our facilities can give secondary school students (up to 24 per workshop) the opportunity to engage with Industry Professionals in a genuine workplace environment. Music Performance students work with our studio technicians to learn the craft of recording their own music at an industry studio where time means $$. Our engineers work with the students and accompanying teachers to give students the best experience of life inside a real commercial recording facility, so come with your instruments and repertoire. 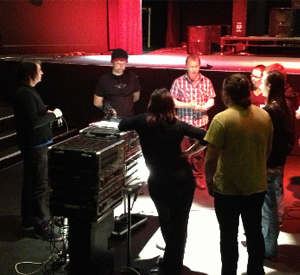 Sound Production students learn about setting up to record a band and follow through the process to mix-down and mastering with our talented engineers. During the workshop, the class will be divided into groups and students will then rotate through a range of activities, incorporating the studio spaces in the facility. All bands doing a recording component will be sent a “mix” of their song by one of our studio engineers! A large format analogue mixing console and ProTools HD recording system where students learn “hands on” in a real recording studio setting. – Record a song with your band in Studio A with a professional sound engineer, and learn all about the professional recording process. – All equipment is supplied, however feel free to bring your guitar with you if you want to use it. Drummers – please bring your own sticks! A dedicated post-production/mixing facility where students can explore advanced mixing techniques and use plug-in effects. – Work through mixing concepts from the perspective of the engineer or the musician, as you mix a professional recording. – Your group can talk through the process with the engineer and make suggestions about how you would like it to sound. Accommodates a variety of practical DAW exercises (eg. using loops & samples) to further engage and inform students at all levels. – Complete an exercise in Pro Tools, the industry standard for music production software, under the guidance of an audio trainer. – The exercise will provide you with an introduction to the software and let you practice your basic audio skills that you’ve already learned. We are open to any suggestions or requests for specific objectives in a school’s Studio Workshops. In particular, we can tailor the events of the day to ensure that components of Units of Competency in a VET Music program can be addressed, allowing teachers to collect evidence for assessment in a real workplace environment. This approach is especially useful in Certificates II and III in Music Indsutry. Contact COSAMP to discuss your options. The Studio Workshop program with COSAMP at Salt Studios is very reasonably priced at $600 (+GST) for a 3 hour session and $900 (+GST) for a 6 hour session.